22 marvellously memorable songs to make teaching maths fun and fabulous! Available with Words on Screen™ v2. Make maths marvellously memorable with this fantastic collection of 22 catchy songs that are fun to sing and easy to learn. Written specifically for 3-7 year olds, this wonderfully diverse selection of maths songs is crammed with addition, subtraction, number bonds, symmetry, shapes and lots more! As you estimate how many grannies would fit in a telephone box; learn your 10x table by digging for pirate treasure; and march along with the even numbers, you’ll find that you learn essential maths skills without even trying! Now available with Words on Screen™ v2 allowing you to display song lyrics on any whiteboard, computer screen, television or interactive touchscreen. The lyrics synchronize with the music as it plays making them easy to teach and easy to learn! The Niki Davies Book of Marvellous Maths Songs is now an award-winning title. 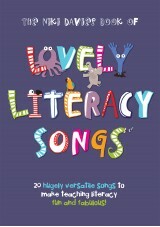 Excellent resource with songs the children love! This is an excellent resource. We use it every day and the children really enjoy the catchy songs. It is very useful for keeping concepts that have already been covered fresh in the children's minds. Highly recommended!